I put everyone's lovely name in my beloved Buddha Bowl, and pulled these three names! I swear on my Grandmother's vintage doily patterns (now you know I mean business! ), I did not cheat in any way! Cross my heart and hope to die, stick a steel crochet hook in my eye! 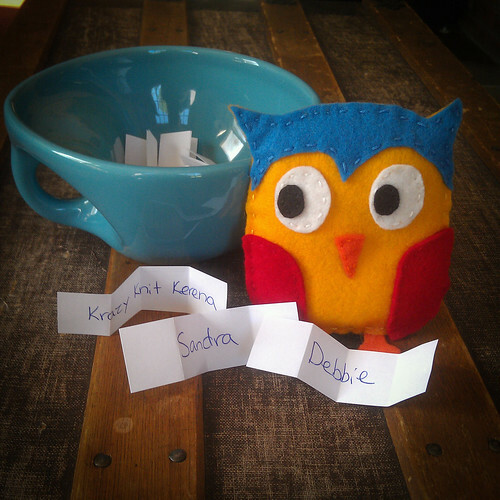 So congratulations krazy knit kerena, Sandra, and Debbie! I will be contacting you ladies to see if you'd like a fox set or a horse, and if you have any color preferences! Oh, one more thing!! I chose the name for the blog's little mascot! Drum roll please....... Oswald! So Carly, since you suggested this perfect name, you win too!! I wish everyone could win, but I have been working on a pattern that I hope to share with you all very soon! Have a great weekend everyone! Oh I love the name Oswald! Congratulations to the winners! Wow...on your Grandmother's vintage doily patterns? You are serious! Lol! Thank you so much, Kate - what exciting news! Oswald the Owl, it fits!